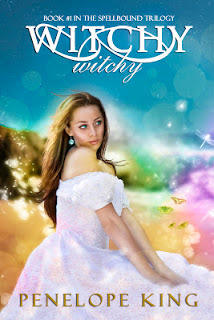 Since, I've never found any book worth reading that falls into #3, I chose to read Witchy Witchy by Penelope King. This one just so happens to cover the requirements of #1 and #2, not to mention that it is my first ever teen fantasy/young adult paranormal romance novel.While I was skeptical at first to read something outside of my particular norm, I found that once I got past the first few pages, I was interested. Here's the story of teen Calista moving to a new town in a new state with her dad so that they can basically start over. Living in the guest house of a mysterious, yet friendly, woman, she figures out really fast that her life is about to change drastically. The good news is that she finally figures out why she is so different from everyone else. And not just different in the sense that all girls feel while during the crazy teen years, but different as in "I'm a witch and have crazy special powers." different. So if that's not enough, she still has to deal with starting a new school complete with mean girls, a boy who really wants to be her boyfriend, and a guy she met once on the beach but can't get out of her mind and meets in her dreams every night. the way it ended. I quickly jumped onto Amazon.com to see if Book 2 was available and found that it was not. I hope it is released soon as I really wanted to see where this is going.